Battle, befriend, or become more than 100 bizarre alien life forms in this hardcover creature collection for the Starfinder Roleplaying Game! The galaxy hosts a staggering array of aliens, both bloodcurdling and benevolent. In this book, you'll find rules and background information about creatures ranging from spiral-winged irokirois and starmetal dragons to living holograms and body-snatching flayer leeches. You'll also find plenty of new equipment and player options, plus rules for gaining a creature companion that can accompany you as a pet, a mount, or even a fearsome combatant! And over a dozen species have rules for making your own playable alien character, so you can play a sapient swarm of tiny insects or a bioluminescent cephalopod native to liquid methane oceans. 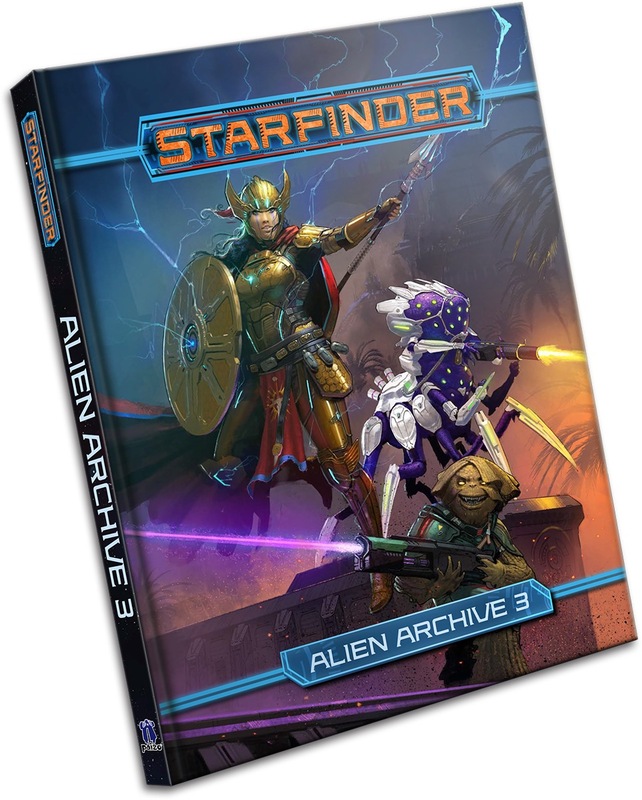 Wander the weird wilds of the galaxy with Starfinder Alien Archive 3! Announced for August! Product image and description are not final. I'm not 100% sure about these being annual releases--I still haven't finished digesting the second one! Sounds nice. Good to see more weird and wacky playable races coming with that swarm race. Any chance that living hologram gets a PC option? If so, how do you get around being tethered to a projector? Ooh, playable swarm! I wonder how armor works there. I wonder if I can cast polymorph to pretend to be humanoid? Surprise people by letting the spell expire? Oh goody! Another Alien Archive! Will be worth every month in wait! Will the Beginner Box and AA3 be the only rulebooks this year, or should we expect something in December? I thought it would be kind of cool to play a sentient virus that could bodyhop and take control of individual host constructs, but Starfinder PCs tend to be way too invested in their own personal bodies for that to work. Actually, since this book is introducing creature companions (finally, finally! :D ), it would be the coolest thing have a living hologram as a construct companion that can hitch a ride in a portable computer or comm unit. Oh yeah, we're going straight up Cortana & Chief with this ruleset. Also, Lying Cat-esque alien and more Preluria lore maaaaybe? Sapient swarm race? Does Paizo have a direct link to my subconscious? I wonder if we'll finally get Sazaron and Dirindi stats this time. Oh yeah, we're going straight up Cortana & Chief with this ruleset? To be far exo-mechanics do this already. Hey, if the living hologram did get a PC option, that would mean being able to play as one of the few excellent parts of Voyager!! There's the Character Operations Manual scheduled for release some time in late 2019. Animal companions! Mounts! A playable swarm! Bioluminescence! I wasn't expecting a new alien archive announcement, that's cool! talk for your self mate its either alien archive 3 or armory 2 gonna be the second book this year so it screams I am coming from December. Nothing in the rules says exocortexes can't interact with others. Again, how much independent personality it has is up to the player/GM. Still, I could go for a more explicit Cortana/MC analogue. You begin play with an exocortex, an artificial processor that interacts with and augments your biological brain’s cognitive functions, which can aid you in a variety of tasks, from combat to digital infiltration. Your exocortex is implanted within your physical body or brain, similar to a piece of cybernetic hardware, allowing your AI to access your mind and feed you information. As you gain levels, your exocortex advances in sophistication and processing power—see Exocortex. Only you can access or interact with your exocortex. Eh, a little hard to say. It sounds plausible that this might only be referring to interactions that grant mechanical benefits, although the wording of the text doesn’t guarantee a player can do this, especially if the text is strictly interpreted. The previous section in the Mechanic writeup, “Artificial Intelligence,” also explicitly states the Mechanic’s Exocortex/Drone is not self-aware. Regardless, there’s definitely a Cortana/EDI/Handsome Jack/Joi/Voyager’s “The Doctor”-sized niche in Starfinder itching to be realized and this book seems like the perfect opportunity to knock it out of the park. Regardless, there’s definitely a Cortana/EDI/Handsome Jack/Joi-sized niche in Starfinder itching to be realized and this book seems like the perfect opportunity to knock it out of the park. And now I want to run an adventure where the party has to deal with a rampant AI. Why especially Cortana and not Siri or Alexa? Oh man, a HAL 9000/GLADOS/SHODAN villain would be the best thing. I’m a little surprised Starfinder hasn’t done as much with AI stuff yet - no killer robot horde or malevolent viral computer-based intelligence under galactic threats, or rogue AIs that can hack or infect a party’s tech gear or nearby constructs (nor any sentient construct creature without a robot body, save for the Living Hologram), AI companions, Tron-esque virtual worlds (Triaxus had something similar to this), etc. I’d love to see a secretive, underground kingdom on some planet’s Infosphere dark net inhabited entirely by sentient programs, capable of digitizing organics’ bodies or themselves inhabiting artificial forms to interact with the outside world. Like a sci-fi spin on visitations to the First World. Lots to do with the new technological possibilities now possible in the Golarion campaign setting. Can’t wait to see what Paizo’s got cooking next! Those two are probably covered pretty well under existing rules for artificial personalities, I’d think. Well I wouldn't call any of them an AI, but aren't they mostly the same, only different brands? Oh geez. Evidently I’m slow. :p Good one. But yes, to clarify: Cortana the fictional AI character from Halo games, not the Microsoft virtual assistant. I’ve totally wanted something like the former as a party companion in Starfinder since before this game was even released. Like a futuristic familiar. To the point where the original voice actor is the voice used in the Microsoft product. If you want a sneak preview of living holograms, that creature in particular is an expansion on the entry in Starfinder Adventure Path #4: The Ruined Clouds! On the AA2 thread you made the same response when people mentioned tieflings and cat people from Vesk-6 so... sazarons and dirindi confirmed in AA3, perhaps. Ah man, Joe. EVERY time I think I’ve reached peak excitement for a book, you people give us one blurb and all of a sudden I’m excited all over again. Loved your Starfinder Wednesday appearance, btw. Vanguard is probably my favourite new class so far. Been itching to make a comic book style fist-fighting brawler for a while now, and that class is everything I had hoped for. Will any of the new aliens incorporate grafts from the new classes? I can totally see a Sorazon vanguard wrecking house. Hmmm. Hard light projector tech item maybe? What are Dirindi and Sazaron? I have never heard of them and google is no help. I hoped for a spaceships/mechs/tanks book next. Well, AA3 will be fun like the first two (a Nuar and Verthani are PCs in my group right now and a uplifted bear and an orc are the newest connections of them), but I have to say it: there are so many topics we can expand regarding spaceships and spacebattle. Races living on the biggest Pact Worlds moons. "Three-eyed, electrically attuned humanoids" & centaur-like creatures with "humanoid torsos and four-legged saurian bodies." They jointly run the government for the Pact World Arkanen, and are probably the only major Pact World species that haven't been statted yet. Kind of important, because it's hard to run adventures on Arkanen or Osoro (the former the largest hub of mystical universities in the Pact Worlds, and the latter a sort of overrun Jurassic Park with a poisonous atmosphere) without them. So this book seems pretty indispensable, especially if you've had plans for a while to make a Technomancer Foaly from Artemis Fowl! I notice Irokiroi are also here from Osoro - very fun! "...bands of cave-dwelling snake-people, jackal-faced arthropods..."
"the stone-faced squidfolk of Vesk-2, the antlike beings of Vesk-5"
Yeah, they look really cool. I've been wanting to play a dirindi since first reading about them in Pact Worlds. Vanguard is probably my favourite new class so far. Been itching to make a comic book style fist-fighting brawler for a while now, and that class is everything I had hoped for. Will any of the new aliens incorporate grafts from the new classes? I can totally see a Sorazon vanguard wrecking house. Ooo...If Living Holograms end up being combatant companions, this might solve the problem of how they might remain mobile and manifest with a party that’s not carrying around extra expensive tech. In their writeup in Dead Suns AA, hologram entities are bound to their projector, so if this is an item in AA3, you’d literally be carrying around a piece of technology that is often used for storing Living Holograms. It's more likely that you carry around something like a shield projector or Summon Creature simulator based on living holograms. Very hyped for this, especially given the possibility of dirindi & sazarons. The idea of a playable swarm is very interesting, as well. that's interesting news had light hologram solarion or vanguard any one. Whoa, whoa, whoa, whoa, whoa...did you just say mounts? Like I get a mount this time around? "..plus rules for gaining a creature companion that can accompany you as a pet, a mount, or even a fearsome combatant! And over a dozen species have rules for making your own playable alien character.."
The back rules portions are easily becoming my favorite parts of the Archives. Building NPCs, Summoning, Polymorph, and now building PC races and companions? Fingers crossed that Armory 2 follows suit with gear or vehicle creation systems! I don't think the intention is that they have an Advanced Races Guide style race builder (but it would be cool if they did). Rather, they're including rules for animal companions/familiars as backmatter and there are over a dozen playable races in the book itself. Just what Starfinder needs: Arnold Rimmer.